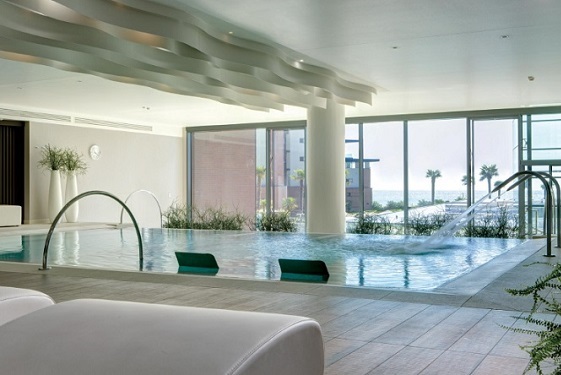 AS SOON as we walked into the hotel lobby of the Almar Jesolo Resort & Spa, I was already very excited to try the spa. Proudly displayed on the check-in desk were a collection of prestigious awards the spa has recently won. The spa was recently awarded the coveted ‘World’s Best Luxury Wellness Spa 2018’ at the World Luxury Spa Awards. After visiting the spa, The Luxury Travel Bible can see why the hotel continues to win awards and many fans. The Ambiance: Almablu Wellness & Spa is a beautifully calm and peaceful cocoon. 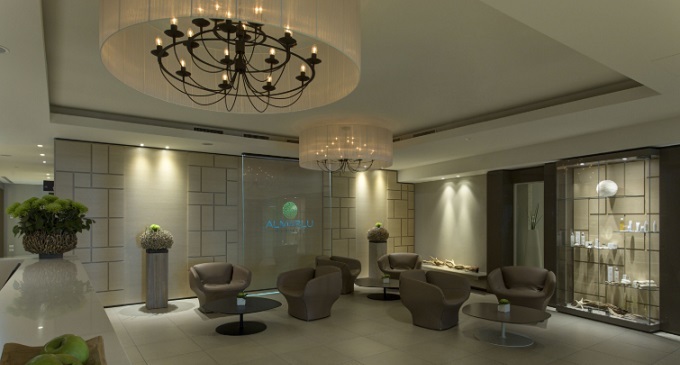 Almablu Wellness & Spa features 9 treatment rooms and, for the ultimate luxury experience, a Private Spa. 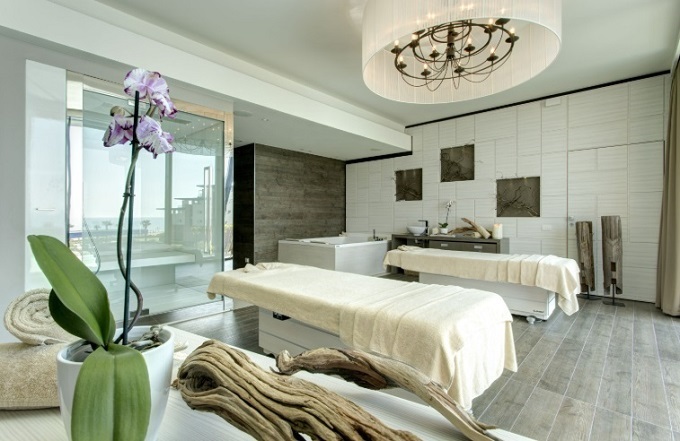 Directly overlooking the beachfront and sea the spa features a stylish and minimalist design and décor inspired by nature. The spa makes clever use of its seafront location, as large windows can be opened to allow natural light and fresh sea breeze to stream through. As I walked through to the spa lobby I was instantly welcomed by the receptionist and was expertly talked through the spa menu by my therapist Barbara. She really listened to my needs and guided me to choosing the perfect massage. The products have been formulated using natural seaweeds, to evoke the sea and its many benefits. The products are designed to ‘moisturise, sooth and nourish the skin’. On the menu: The spa menu has been curated to help guests reach a state of complete physical and mental wellbeing. I opted for a massage which was described as being for ‘all those who need to improve the quality of their sleep or are unable to sleep’, which to me sounded like a perfect way to spend an afternoon. The Warrior’s Rest massage will ‘stabilize the flow of energy between body and head’. It was a beautifully relaxing and soothing massage as well, which already left me half in the land of nod during the massage. The Spa: After my massage I took some time to explore the rest of the Spa’s faciltities. I was particularly taken by the large light installation in the spa lobby which read, ‘The time you enjoy wasting, is not wasted time’. I took this as a sign that I should spend the rest of the afternoon relaxing by the pool. The Spa is spacious, with over 2,000 square meters to help guests relax. The ‘Wet Area’ features a large indoor/outdoor heated swimming pool, a range of saunas, steam baths, a Turkish salt bath, multi-sensory showers. TLTB tested all of these in the pursuit of relaxation however, drew the line at the ice shower. Although I have it on good authority that it leaves you feeling VERY refreshed after. Almablu Wellness & Spa also has a modern gym which has stunning views of the beach and ocean and also offer guests a range of studio classes including Pilates, yoga and Tai Chi. The Result: My treatment left me feeling relaxed and promised a great night’s sleep. Did it work? Well, put it this way… I remember my head hitting the pillow and then waking up feeling refreshed the next day. Something that is very unusual for my usual sleeping habits. In fact, I woke up so refreshed that rather than rushing straight to breakfast to grab a caffeine-rich coffee, I first headed to the Spa again to indulge in an early morning swim. The wellness attitude of Almablu really is inspiring. A few days of R&R and relaxing at the spa, I left Almar Jesolo Resort & Spa feeling like a different person to the one that arrived.